Capturing geothermal energy to produce electrical power is accomplished through dry steam flash and through binary-cycle steam power plants. The most common way of capturing the energy from geothermal sources is to tap into naturally occurring hydrothermal convection systems. The geothermal systems produce hot water or steam when cooler water makes its way deep below the surface of the earth, where it is continually heated, and then rises to the surface. When the steam is brought to the surface, it is used to drive turbines that turn electric generators. Geothermal energy for generating electrical power comes from high and intermediate-temperature sources. The energy from these sources is used to turn turbines that rotate electrical generators to produce electrical power. Very hot water and steam naturally rise to the surface, where they are captured. The steam is directed across the blades of a turbine to drive it and spin the electric generator. In other applications where the steam does not make it all the way to the earth’s surface, holes are drilled into the rock to depths that allow water to be injected into them, and the steam that is produced is captured. When the source is moderately hot but not hot enough for creating steam, the hot water can be sent through a heat exchanger to heat a secondary fluid. Geothermal power plants can be based on three systems, all of which use hot water or steam from the source and then return the water to prolong the life of the source. 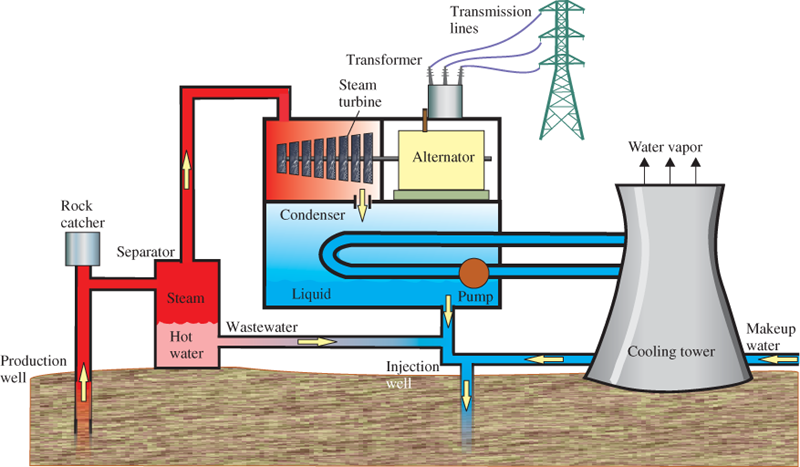 In the simplest system, steam goes directly through the turbine, then into a condenser where the steam is condensed into water. In a second system, very hot water under high pressure is brought to the surface and depressurized (or flashed) into steam, then used to drive the steam turbine. In the third system, called a binary system, the hot water cannot be used directly, so it is passed through a heat exchanger, where it heats a second working fluid used in a closed loop with the turbine. These three systems are discussed in the following paragraphs. Dry steam (also called superheated steam) is steam so hot that it contains no liquid water in suspension. 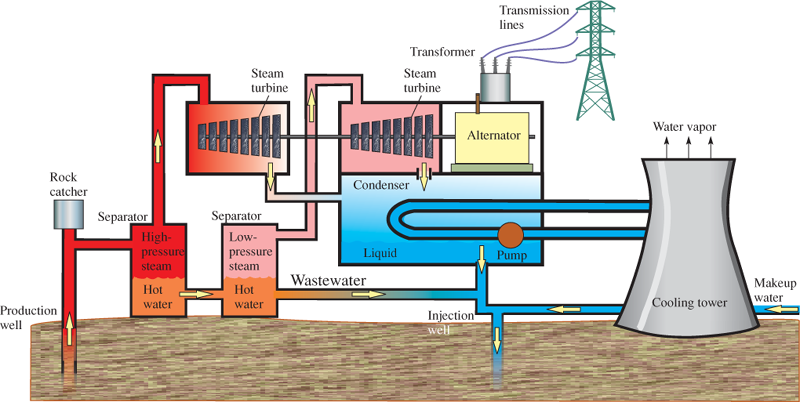 When a geothermal reservoir is located in a place that has steam at the surface, the steam can be piped directly to a steam turbine that drives an electric generator. This type of plant is called a dry-steam plant. The largest dry steam power production facility in the world is at the Geysers in Northern California. Figure 1 The Geysers plant in Northern California was featured in an article in Fortune magazine in 1969 as “a development whose significance goes far beyond its size.” The article went on to note that Pacific Gas and Electric (PG&E) in 1960 was the first US utility to generate geothermal power. The steam at the Geysers has a temperature greater than 235° C (455° F), so it has sufficient heat energy to turn the turbine and generator. The steam enters the turbine while it is very hot, and the energy in the steam is released. As the steam passes over the turbine blades, it loses energy. When the steam exits the turbine, it has less pressure and it is cooler. Some of it may start to condense in the turbine, creating water droplets. The water vapor completes the condensation process in a unit called the condenser, which is much cooler than the remaining steam. The cooler condenser extracts most of the remaining water from the air. This water can be reinjected down a second well to replenish the geothermal reservoir. At some dry-steam plants, adequate amounts of fresh water are introduced to restore the reservoir when some of the steam escapes to the atmosphere after it passes through the steam turbine. Figure 2 shows a basic diagram of a dry-steam plant. In Figure 2, you can see that dry steam is tapped by a well called the production well. Steam is under high pressure, and rocks and debris frequently come up from the well with the steam. A rock catcher is inserted between the steam pipe and the turbine to avoid damaging the turbine. In a dry-steam system, the steam is piped directly to the turbine. The turbine and generator are the basic energy converters in the system. Basically, the turbine converts heat energy in the steam to mechanical work turning the generator. The generator converts the mechanical work to an electrical output. 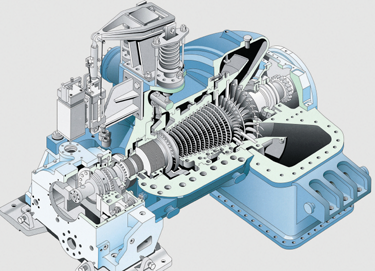 Figure 3 shows a cutaway view of a steam turbine. Steam is piped into the turbine, where it expands in nozzles and discharges at a high velocity and strikes moving blades. The input energy in the steam is proportional to the steam velocity and hence the available energy. As the steam strikes the turbine blades, it gives up its energy and expands. The steam is directed in an increasingly larger radius path around the turbine to the next stage. Succeeding stages are larger and consequently, have higher tangential velocity due to the increased distance. The steam, now with lower energy and less pressure, is directed to progressively larger stages, where it gives up more of its energy at each pass. Finally, it is exhausted from the turbine and is condensed back to a liquid. As shown in Figure 2, the steam flows into a steam surface condenser after it passes through the turbine. Cool water from a cooling tower is sprayed over the remaining steam in the condenser, causing the steam to condense into water. The water is pumped out of the bottom of the condenser into an air-cooled tower, where it is cooled further. 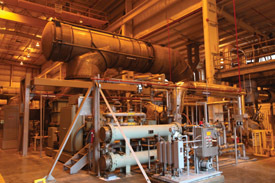 A second bypass condenser is connected in a separate path for the hot input steam, which allows the turbine to be offline for maintenance or any other reason. If steam were to bypass the turbine and allowed to condense in downstream piping, pressure spikes and high temperatures could cause damage. The bypass condenser is a separate condenser that is ready to go online automatically should the turbine be offline. For the cooling tower to provide a continuous supply of cool water, air is drawn through the bottom of the cooling tower, and air and water vapor is vented out the top of the atmosphere. Water that pools in the bottom of the cooling tower is pumped back down a second well called an injection well. This water replenishes the geothermal resource deep below the surface. Because some of the water makes its way back into the atmosphere, additional water is added to the injection well to keep producing sufficient steam. At the Geysers, this additional water comes from treated wastewater from the city of Santa Rosa. Figure 4 shows one of the plants at the Geysers, with water vapor escaping to the atmosphere. Flash steam is a mixture of pressurized hot water and steam that converts to steam when pressure is released. This combination of liquid and vapor in an underground reservoir is called a liquid-dominated reservoir; it is produced when large volumes of water from artesian wells come into contact with extremely hot rocks deep in the earth. The temperature of this resource for the flash-steam plant is greater than 182° C (360° F). In the flash-steam plant, the mixture of vapor and high-pressure hot water is pumped through a special control valve or orifice plate that expands it, reducing the pressure and causing some of the liquid to “flash” instantly into steam. The basic single-flash system is shown in Figure 5. Once the steam is separated from the remaining hot water and brine, the process is the same as in the dry-steam system. In some systems, waste hot water is sent to direct heat users (not shown). Some of the water is returned to the geothermal reservoir through the injection well, which includes additional makeup water to keep the resource in equilibrium and make up for lost water. 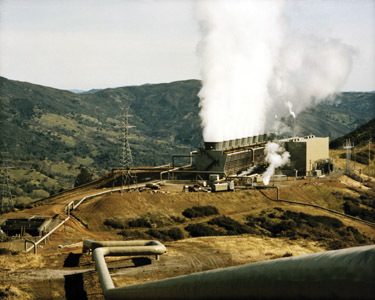 Figure 4 Dry-Steam Geothermal Power Plant at the Geysers in California. The cooling towers in the background are emitting plumes of condensed water vapor. Figure 5 Single-Flash System. In a double-flash system, the hot water is under pressure and can create steam in a second separator. When the source is very hot, the water that remains from the separator may be much hotter than the normal boiling temperature of 100° C (212° F) because it is still under pressure that is higher than atmospheric pressure. Additional steam can be created from the hot water by expanding it through a second separation system. This type of geothermal plant is called a double-flash steam plant. In a double-flash system, the second expansion creates lower-pressure steam, which is routed to a separate low-pressure turbine. About 20% more electrical power can be produced in a double-flash system but at greater cost due to the second turbine, which is a special low-pressure turbine. In addition, a double-flash system has extra piping and valves. The double-flash steam plant is used in several locations in California in spite of the additional cost. 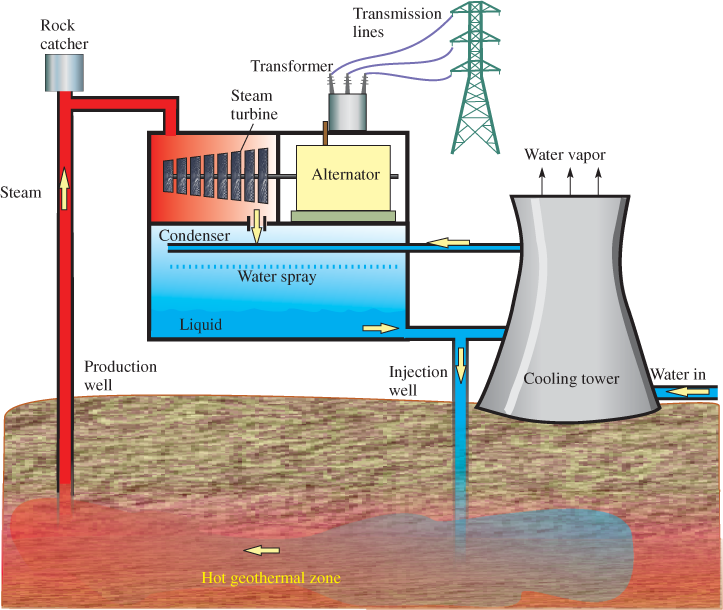 Figure 6 shows a diagram of a double-flash geothermal power plant. 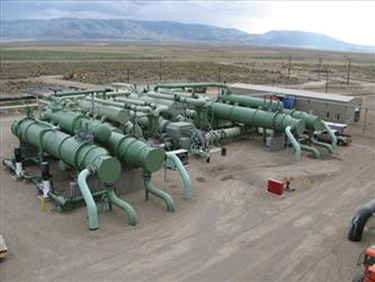 The geothermal binary-cycle plant is different from dry-steam and flash-steam systems because the hot brine water and steam from the geothermal reservoir go directly to a heat exchanger and never comes in contact with the turbine that drives the generator. A secondary fluid is heated and vaporizes. It circulates through a closed loop to the turbine in the traditional Rankine cycle. Generally, the secondary fluid is an organic fluid (contains carbon) that has a lower boiling point than water. For this reason, binary-cycle plants are also known as organic Rankine cycle (ORC) plants. Figure 7 shows a diagram of a binary-cycle plant for geothermal electricity production. Binary-cycle plants have two advantages for geothermal applications. The major advantage is the same as for biofuel plants: The binary-cycle plant can produce power with lower-quality heat sources. The fluid in the secondary loop of the heat exchanger is an organic fluid such as a thermal oil or isobutane that vaporizes at a lower temperature. The fluid is selected based on the temperature of the source. Because the vaporization temperature in the secondary loop is lower than that of steam, it can produce vapor even when the temperature of the brine solution is in the moderate range (typically 110° C to 176° C) or even lower. The lower-temperature operation allows ORC systems to operate in cases where a standard steam plant cannot. Figure 7 Binary-Cycle Plant. This type of plant is also known as an organic Rankine cycle (ORC) plant. The secondary fluid is shown in green in this diagram to distinguish it from the underground source. The closed secondary loop is a second advantage to binary-cycle systems for geothermal applications. Geothermal sources frequently contain dissolved materials that may be corrosive and also may contain small debris carried up from the geothermal reservoir. Corrosive steam and debris are particularly hazardous to turbines because they spin at very high rates, so the binary-cycle plant avoids these problems by recycling the underground water and brine in a separate loop, where it gives most of its heat energy to a secondary fluid. The turbine is exposed only to this clean material, which is recycled in a separate closed loop. Because the two loops in a binary-cycle system are completely enclosed, there is less waste and lower water usage than in other geothermal systems. By its nature, the binary-cycle plant does not release any pollutants and does not have any emissions except for a small amount of water vapor at the cooling tower. The main use of water is to cool the working fluid; it is important to cool it as much as possible for an efficient operation. The vapor from the cooling towers is supplied by a separate source and does not include anything from the underground source or the secondary loop. As a result, a binary plant pollutes the least of any of the geothermal types. The binary-cycle electrical generating plant was first introduced in Russia in the late 1960s; the first operating plants in the United States started in the early 1980s. Figure 8 shows a binary-cycle geothermal plant in Raft River, Idaho. Today more systems are being brought online in locations where intermediate temperature geothermal resources are available (primarily in Alaska and the western United States.) Some of the sites include Chena Hot Springs, Alaska; San Emidio, Nevada; Raft River, Idaho; and Neal Hot Springs in eastern Oregon. In some cases, deeper wells are being tested in locations in which geothermal electrical power was not thought possible. What is a dry steam and what is a dry-steam plant? What is a double-flash system? How does it differ from a single-flash system? What are two important advantages to a binary-cycle geothermal plant? What is an enhanced geothermal system? Dry steam is superheated steam that has no water vapor in suspension. 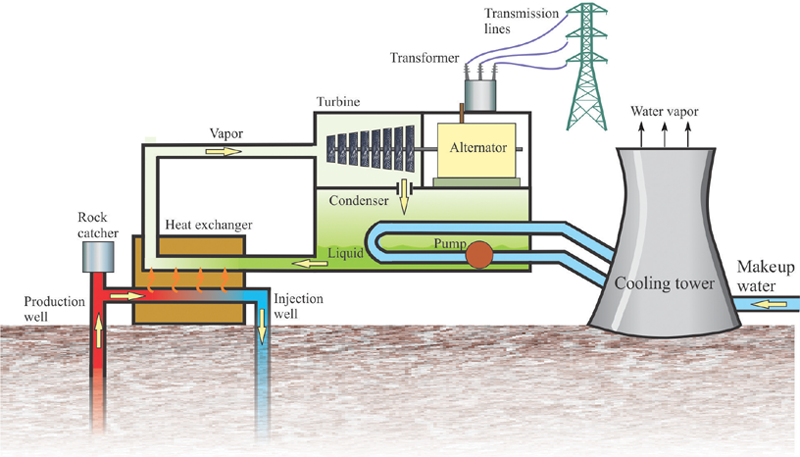 A dry-steam plant takes advantage of this resource by routing the steam directly to a turbine, which turns a generator. A double-flash system has two stages of pressure reduction where brine is flashed into steam. A single-flash system has one stage of pressure reduction where brine is flashed into steam. Binary-cycle geothermal plants can operate with lower- temperature resources and do not circulate the underground water through the turbine, thus avoiding problems with debris and corrosive substances. A geothermal system that is deficient in water or permeability is made productive by artificial means.